Moana Lodge Hotel is set within a lush tropical garden, and features an outdoor pool, an ocean-view restaurant, and rooms have a private porch with spectacular garden views. Amenities at the hotel include free Wi-Fi, barbecue area, massages, yoga, and tour desk. The decor is African-style. 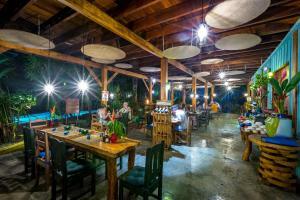 The restaurant offers both international and typical Costa Rican cuisine. There is also a pool bar and a TV lounge that has over a hundred different movie titles for guests to choose from. Tambor Airport is a 30-minute drive away, and an airport shuttle is available for an extra charge. El Moana Lodge Hotel está en un jardín tropical exuberante y cuenta con una piscina al aire libre y un restaurante con vistas al océano. Las habitaciones tienen un porche privado con unas vistas espectaculares al jardín. El hotel ofrece muchas comodidades, como conexión Wi-Fi gratuita, zona de barbacoa, servicio de masajes, yoga e información turística. Su decoración es de estilo africano. El restaurante sirve cocina internacional y típica costarricense. También hay un bar y una sala de TV, con cientos de películas para elegir. Por un suplemento se ofrece servicio de enlace con el aeropuerto de Tambor, situado a 30 minutos en coche. 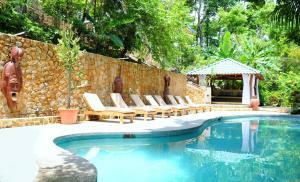 Offering an outdoor pool and a restaurant, Hotel Leyenda is located in the tropical town of Carrillo. It is just 1.2 miles from the beach and boasts free Wi-Fi and continental breakfast. Rooms here will provide you with a TV, air conditioning and a minibar. The private bathrooms come with a shower, and while most rooms have pool or garden views. Guests enjoy traditional cuisine at the on-site restaurant, and other options can be found in the town centre, just 1.2 miles away. The property features a tour desk and can lend umbrellas, tables and hammocks for use at the beach. Cmaronal River is 1.9 miles from Hotel Leyenda, while Nicoya, a colonial town, is 24.9 miles away. Carrillo Airport can be reached in a 15-minuite drive. El Hotel Leyenda, con piscina al aire libre y restaurante, se encuentra en la ciudad tropical de Carrillo. Está a solo 2 km de la playa y ofrece conexión Wi-Fi gratuita, además de un desayuno continental. Las habitaciones incluyen TV, aire acondicionado, minibar y baño privado con ducha. La mayoría tiene vistas a la piscina o al jardín. El hotel alberga un restaurante de cocina tradicional. Hay otros locales de restauración en el centro de la ciudad, a solo 2 km. El hotel dispone de un mostrador de información turística y ofrece un servicio de préstamo de sombrillas, mesas y hamacas para usar en la playa. 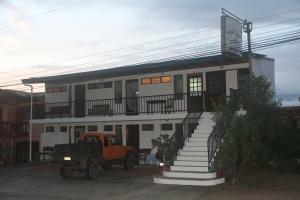 El Hotel Leyenda se encuentra a 3 km del río Camaronal y a 40 km de la ciudad colonial de Nicoya. El aeropuerto de Carrillo está a 15 minutos en coche. Offering an amazing rainforest setting, La Palapa Eco Lodge Resort features an outdoor swimming pool and accommodation overlooking its tropical gardens. 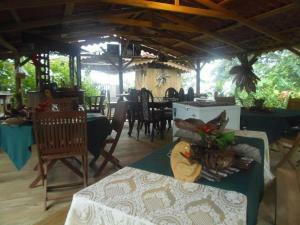 It has an ideal setting for bird watching and is 3 km from Matapalo Beach. 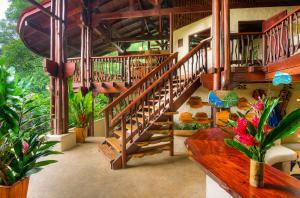 All bright accommodation at La Palapa Eco Lodge Resort has traditional Costa Rican décor and cooling tiled floors. There is a private bathroom and free Wi-Fi. Bungalows also include a kitchen and a living area. Served in its open-air restaurant, La Palapa offers a traditional Costa Rican breakfast, including fresh fruit and local dishes such as Gallo Pinto. Meat, fish, rice and bean dishes are on offer for lunch and dinner, and are prepared using produce grown on the resort's organic farm. The surrounding Portalón rainforest is home to a range of butterfly species and provides an ideal location for hiking and cycling. Playa Linda and Dominical beaches are within 16 km of the Eco Lodge, and there is also a sea turtle refuge centre nearby. Offering an amazing rainforest setting, La Palapa Eco Lodge Resort features an outdoor swimming pool and accommodation overlooking its tropical gardens. 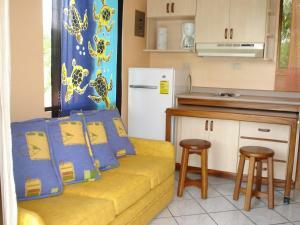 It has an ideal setting for bird watching and is 3 km from Matapalo Beach. 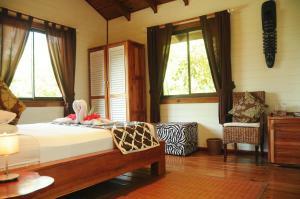 All bright accommodation at La Palapa Eco Lodge Resort has traditional Costa Rican décor and cooling tiled floors. There is a private bathroom and free Wi-Fi. Bungalows also include a kitchen and a living area. Served in its open-air restaurant, La Palapa offers a traditional Costa Rican breakfast, including fresh fruit and local dishes such as Gallo Pinto. Meat, fish, rice and bean dishes are on offer for lunch and dinner, and are prepared using produce grown on the resort?s organic farm. The surrounding Portalón rainforest is home to a range of butterfly species and provides an ideal location for hiking and cycling. Playa Linda and Dominical beaches are within 16 km of the Eco Lodge, and there is also a sea turtle refuge centre nearby. 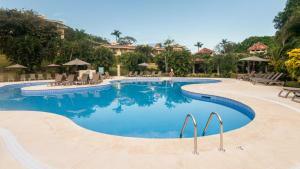 Set on Montezuma Beach and 10 km from Cabo Blanco Nature Reserve, Casitas Sollevante features an outdoor swimming pool. It offers accommodation with terraces and Pacific Ocean views. Casitas Sollevante offers spacious, air-conditioned apartments, houses and villas with bright décor. All accommodation features a living room, and a kitchen with a fridge, coffee maker and a dining area. 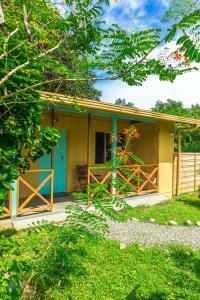 Surrounded by gardens, Casitas Sollevante has a picturesque setting on the Nicoya Peninsula. The surrounding area and coastline are ideal for diving, horse riding and fishing. The centre of Montezuma is a 5-minute drive from the resort. Palo Verde and Dalia national parks are within 2 hours' drive of the Casitas. El Casitas Sollevante está situado en la playa de Montezuma, a 10 km de la reserva natural Cabo Blanco. El establecimiento dispone de una piscina al aire libre y alojamiento con terrazas y vistas al océano Pacífico. Los apartamentos, casas y villas del Casitas Sollevante son amplios y presentan una decoración llamativa. Todos los alojamientos cuentan con aire acondicionado, sala de estar y cocina con nevera, cafetera y zona de comedor. El Casitas Sollevante está rodeado de jardines y goza de una ubicación pintoresca en la península de Nicoya. Los alrededores y la costa son los lugares ideales para practicar submarinismo, equitación y pesca. El centro de Montezuma se encuentra a 5 minutos en coche del complejo. Los parques nacionales de Palo Verde y Dalia están a 2 horas en coche del Casitas. Offer views of the surrounding hills, this comfortable hotel features free Wi-Fi and free on-site parking in Orosi. It is just 650 feet from the thermal hot springs. The practical rooms at Hotel Reventazon & Guesthouse feature a cable TV, a fan and a private bathroom with a shower and toilet. There is a small supermarket 50 feet from the property, and restaurants serving national cuisine and seafood can be found within 1,650 feet. Tepanti National Park, which boasts beautiful waterfalls and offers guests hiking and nature tours, is a 20-minute drive from the Hotel Reventazon & Guesthouse. There is a large waterpark within 1 km, while Juan Santamaria International Airport can be reached within a 2-hour drive. Este hotel confortable, situado en Orosí, ofrece vistas a las colinas de los alrededores, conexión WiFi gratuita y aparcamiento gratuito. Se encuentra a solo 200 metros de las aguas termales. Las habitaciones del Hotel Reventazon & Guesthouse son funcionales y disponen de TV por cable, ventilador y baño privado con ducha y aseo. A 20 metros del establecimiento hay un supermercado pequeño y a 500 metros, restaurantes que sirven cocina nacional y marisco. El parque nacional de Tepanti, que alberga cascadas hermosas, así como rutas de senderismo y excursiones en plena naturaleza, se halla a 20 minutos en coche del Hotel Reventazon & Guesthouse. A 1 km hay un parque acuático muy grande, mientras que el aeropuerto internacional Juan Santamaría queda a unas 2 horas en coche. Offering an outdoor swimming pool and an extensive garden, Hotel Banana Azul is located in Playa Negra beach and 1.6 miles from Puerto Viejo town centre. Free WiFi access is available in all areas. The rooms come with outdoor seating area and a fan. The private bathrooms have shower. Guests can enjoy in the on-site restaurant local food and international dishes. Other options can be found in Puerto Viejo town centre. 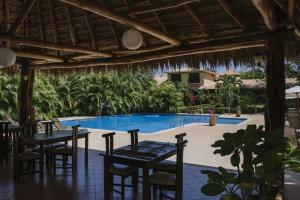 At Hotel Banana Azul you will find a terrace and a bar. Other facilities offered at the property include a tour desk and luggage storage. 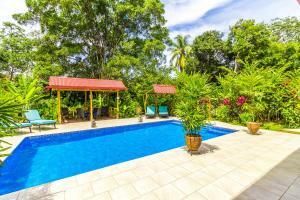 This property is 3.1 miles from Playa Cocles and 6.2 miles from Manzanillo Wildlife Reserve. Limón International Airport is 50 minutes’ drive away. El Hotel Banana Azul está situado en Playa Negra y se encuentra a 2,5 km del centro de Puerto Viejo, y cuenta con piscina al aire libre y un amplio jardín. Hay conexión Wi-Fi gratuita en todas las instalaciones. Las habitaciones cuentan con zona de estar al aire libre y ventilador. El baño privado tiene ducha. El restaurante del establecimiento sirve comida local y platos internacionales. En el centro de Puerto Viejo hay más opciones. El Hotel Banana Azul cuenta con una gran terraza y bar. También ofrece mostrador de información turística y consigna de equipaje. Este establecimiento está a 5 km de la playa de Cocles y a 10 km de la reserva natural de Manzanillo. El aeropuerto internacional de Limón se encuentra a 50 minutos en coche. Featuring an outdoor swimming pool and apartments with balconies and free Wi-Fi, Hotel La Dolce Vita is situated on Esterillos del Oeste Beach. Set in a charming villa, it is surrounded by attractive gardens and overlooks the Pacific Ocean. Each air-conditioned apartment at the Dolce Vita has simple décor with tiled floors. All have a seating area with a sofa bed, while kitchenettes come with a fridge, electric hob and coffee maker. La Dolce Vita serves a continental breakfast in its dining room. There is a selection of bars and restaurants in Esterillos Centro, less than 2 km away. The apartments are ideally situated for exploring the Pacific coastline, and local activities include fishing, kayaking and whale watching. Carara Nature Reserve is a 30-minute drive away. Jaco is 20 minutes away by car and Playa Hermosa is a 10-minute drive. El hotel La Dolce Vita está situado en la playa de Esterillos del Oeste y cuenta con piscina al aire libre y apartamentos con balcón y conexión Wi-Fi gratuita. Está ubicado en una encantadora villa rodeada por bonitos jardines y ofrece vistas al Océano Pacífico. Los apartamentos del Dolce Vita presentan una decoración sencilla con suelos de baldosas. Todos disponen de zona de estar con sofá cama y zona de cocina con nevera, hornillo eléctrico y cafetera. La Dolce Vita sirve un desayuno continental en el comedor y se encuentra a menos de 2 km de Esterillos Centro, donde hay numerosos bares y restaurantes. Los apartamentos gozan de una ubicación idónea para recorrer la costa del Pacífico. Entre las actividades locales que se pueden practicar se encuentra la pesca, el piragüismo y la observación de ballenas. La reserva natural de Carara está a 30 minutos en coche y Jaco y Playa Hermosa a 20 y 10 minutos en coche respectivamente. 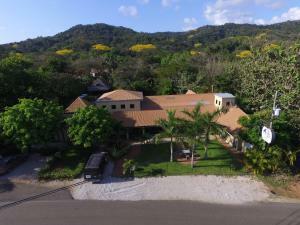 Casa Rolando Golfito is located 1,650 feet from Golfito Bay and 0.6 miles from Golfito Nature Reserve. It features a furnished terrace with a swimming pool, free Wi-Fi and sauna. 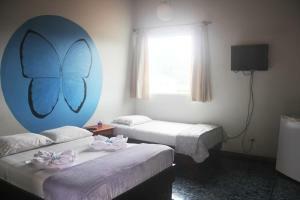 The air-conditioned rooms offer a sofa, minibar, a fan and flat-screen TV. The bathrooms are private and come with a shower. 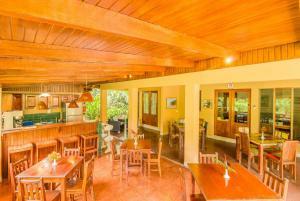 The Casa Roland Golfito has a restaurant that serves international cuisine for the guests. There is also an on-site bar. 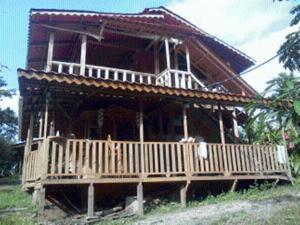 This property can arrange activities like fishing and hiking. It has a gym, billiards, games room and a sauna. The Corcovado National Park is 1 hours’ drive away and Golfito International Airport is just 1.2 miles away. Airport shuttle for free is available. La Casa Rolando Golfito se encuentra a 500 metros de la bahía de Golfito y a 1 km de la reserva natural de Golfito. Cuenta con una terraza amueblada con una piscina, conexión Wi-Fi gratuita y sauna. Las habitaciones disponen de aire acondicionado, un sofá, minibar, ventilador y TV de pantalla plana. Además, cuentan con baño privado con ducha. La Casa Roland Golfito dispone de un restaurante que sirve cocina internacional. El establecimiento también cuenta con un bar. Este establecimiento puede organizar actividades como pesca y senderismo. También cuenta con un gimnasio, mesas de billar, una sala de juegos y sauna. El parque nacional de Corcovado se encuentra a 1 hora en coche y el aeropuerto internacional de Golfito está a tan solo 2 km. Se ofrece servicio gratuito de enlace con el aeropuerto. 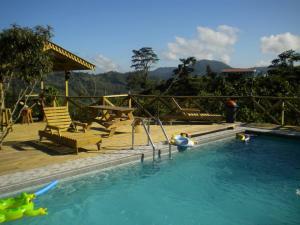 Offering an outdoor swimming pool, Hotel el Mono Feliz offers accomdation in Ojochal, Costa Rica. The 3 acre property features several gardens, a small river, two small creeks, and walkable grounds. Free parking and wifi in rooms and public areas are available. All of the rooms at the hotel feature private bathrooms and hot water showers. Some of the rooms have available air conditioning. Some rooms are equipped with a kitchenette. The restaurant at the property serves a breakfast for a charge free with most rates . El Mono Feliz can arrange tours to spot whales and dolphins and to the mangroves as well as hikes in primary forest. The beaches of Marino Ballena National Park with views of the Pacific are just 5 minutes’ drive from El Mono Feliz. El Hotel El Mono Feliz ofrece alojamiento en Ojochal, Costa Rica, y cuenta con piscina al aire libre. Este establecimiento de 1,2 hectáreas alberga varios jardines, un río pequeño, 2 arroyos y zonas ideales para pasear. Se facilita aparcamiento gratuito. Además, hay WiFi en las habitaciones y en las zonas comunes. Todas las habitaciones constan de baño privado y ducha de agua caliente. Algunas habitaciones disponen de aire acondicionado, mientras que otras incluyen zona de cocina. El restaurante del establecimiento sirve un desayuno gratuito (incluido en la mayoría de las tarifas). Además, El Mono Feliz organiza excursiones para observar ballenas y delfines. También se ofrecen visitas guiadas a los manglares y caminatas por el bosque virgen. El Mono Feliz se halla a solo 5 minutos en coche de las playas del parque nacional Marino Ballena, que disfrutan de vistas al Pacífico. 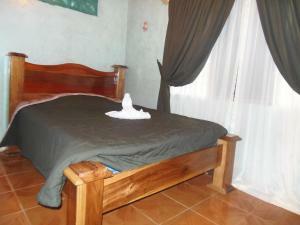 Set on the Water and Peace Biosphere Reserve, this accommodation is 11 km from Volcano Tenorio National Park. Sueño Celeste BnB is a bird-watching lodge located on Bijagua, Costa Rica. Surrounded by lush vegetation, Sueño Celeste features rooms equipped with a queen-size bed and a private bathroom with shower. 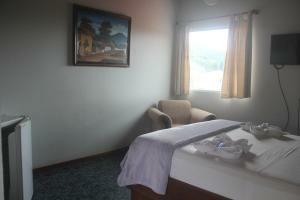 There is also a sofa bed and a private balcony, offering views of the volcano and the rainforest. Guests can enjoy a daily breakfast that includes fresh fruits, farm eggs and homemade breads, cakes and jams. It is served on the property's gallery, and there is also a coffee service available all day. Staff at Sueño Celeste BnB can book a wide range of activities such as night tours, trips to national parks and hike tours, amongst others. Daniel Oduber International Airport is around 1 hour drive. Este establecimiento, situado en la reserva de la biosfera Agua y Paz, está a 11 km del parque nacional del volcán Tenorio. El Sueño Celeste B&B es un establecimiento para observar aves, situado en Bijagua, Costa Rica. El Sueño Celeste está rodeado de vegetación exuberante. Sus habitaciones disponen de 1 cama grande y un baño privado con ducha. También tiene otra cama y un balcón privado con vistas al volcán y la selva. El desayuno diario incluye fruta fresca, huevos de granja y mermeladas, pasteles y pan casero. Se sirve en el porche del establecimiento. También hay servicio de café disponible durante todo el día. El personal del Sueño Celeste B&B podrá reservarle diversas actividades, como visitas nocturnas, excursiones a parques nacionales y rutas de senderismo. El aeropuerto internacional de Daniel Oduber está a aproximadamente 1 hora en coche de este establecimiento de tipo alojamiento y desayuno. 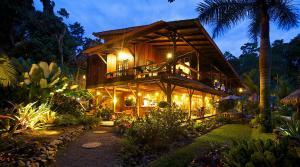 Hotel Jardines De Monte Verde is located in Costa Rica's Monteverde, a 5-minute drive from Santa Elena. 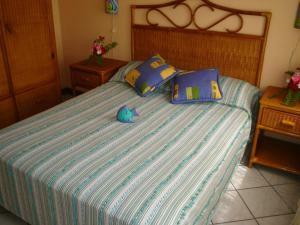 Set in tropical gardens, it offers free Wi-Fi and rooms with mountain or Nicoya Golf views. Rooms feature wooden floors, a sofa and TV. Some have a balcony. The private bathroom comes with a hairdryer and toiletries. Breakfast is included in the room rate. You will find restaurants, souvenir shops, art galleries and an internet café nearby. The Coffee House Restaurant, 5 minutes' walk away offers guests a discount on meals there. Free on-site parking is offered and you can hire a bicycle at the tour desk. A wide selection of tours can be arranged, such as Arenal Lagoon tours, canopy and butterfly farm tours. El Hotel Jardines de Monte Verde se encuentra en Monteverde, Costa Rica, a 5 minutos en coche de Santa Elena. Está rodeado de jardines tropicales y ofrece conexión Wi-Fi gratuita y habitaciones con vistas a la montaña o al campo de golf de Nicoya. Las habitaciones tienen el suelo de madera, sofá y TV. Algunas disponen de balcón. El baño privado cuenta con un secador de pelo y artículos de aseo. La tarifa de la habitación incluye el desayuno. Cerca hay restaurantes, tiendas de souvenirs, galerías de arte y un cibercafé. Los huéspedes se beneficiarán de descuentos en el restaurante Coffee House, situado a 5 minutos a pie. El establecimiento ofrece aparcamiento gratuito y un servicio de alquiler de bicicletas en el mostrador de información turística. Se pueden organizar varios tipos de excursiones, como viajes a la laguna de Arenal, paseos bajo palio y visitas a una granja de mariposas. 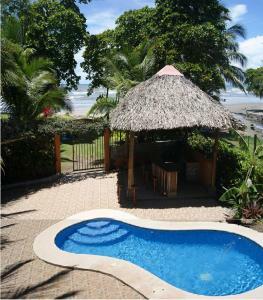 Set on a private part of Nicuesa Beach, Playa Nicuesa Rainforest Lodge has a tropical setting in the Golfo Dulce region. 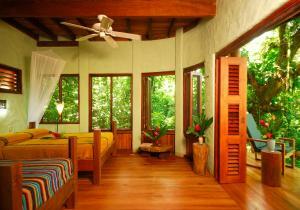 It offers rooms with balconies and rainforest views, as well as a range of outdoor activities. This eco-friendly resort features accommodation set in attractive wooden cabins. All rooms have a seating area and a private entrance. 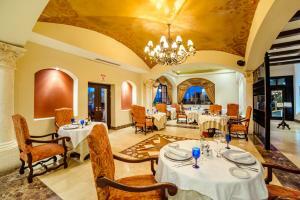 Guests can enjoy a range of South American cuisine in the Playa Nicuesa’s restaurant. There is also a bar and lounge area with hammocks. 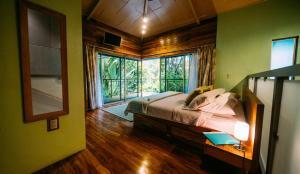 The Rainforest Lodge organises activities including yoga classes, kayaking and snorkelling. The surrounding rainforest is ideal for hiking and horse riding. The Lodge has a peaceful, picturesque location and is accessible by boat only. El Playa Nicuesa Rainforest Lodge se halla en una zona privada de la playa de Nicuesa, en la región tropical del golfo Dulce. Dispone de habitaciones con balcón y vistas a la selva. Los huéspedes podrán practicar numerosas actividades al aire libre. Este complejo ecológico ofrece alojamiento en preciosas cabañas de madera con zona de estar y entrada privada. Los huéspedes podrán degustar numerosos platos sudamericanos en el restaurante del Playa Nicuesa. También hay un bar y una zona de salón con hamacas. 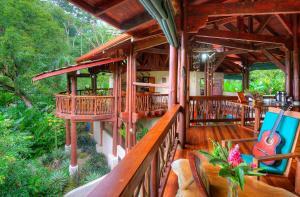 El Rainforest Lodge organiza diversas actividades, como clases de yoga, canoa y buceo. En la selva cercana se puede practicar senderismo y montar a caballo. El Lodge goza de una ubicación tranquila y pintoresca. Solo se puede llegar a él en barco. Offering impressive views of the Nicoyan Gulf, Monteverde Inn has a beautiful setting a 10 minute drive from Santa Elena. It features bright accommodation in attractive grounds. 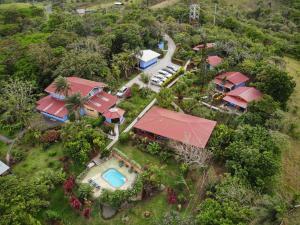 Monteverde Inn offers rooms and villas with free Wi-Fi access. Villas also feature a kitchen, and a sitting area. Breakfast is served in the Inn's dining room. The property overlooks the surrounding forest and trails, which are ideal for hiking. 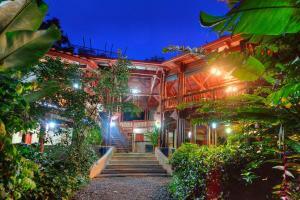 The staff at the 24-hour front desk can arrange excursions to Monteverde Cloud Forest, a 5 minute drive away. Arenal Volcano Park and Lake are less than 30 miles from the hotel. El Monteverde Inn tiene unas vistas impresionantes al golfo de Nicoya y se encuentra a 10 minutos en coche de Santa Elena. Ofrece opciones de alojamiento luminosas, situadas en un bonito recinto. Las villas y habitaciones del Monteverde Inn cuentan con conexión Wi-Fi gratuita. Las villas incluyen además cocina y zona de estar. El desayuno se sirve en el comedor del Inn. El establecimiento ofrece vistas a los bosques y a los caminos de los alrededores, ideales para hacer senderismo. El personal de recepción está a su disposición las 24 horas y podrá ayudarle a organizar excursiones al Bosque Nuboso Monteverde, situado a 5 minutos en coche. El parque nacional del Volcán Arenal y el lago Arenal se encuentran a menos de 50 km. Overlooking Culebra Bay's spectacular cliffs, this all-inclusive, adults-only complex features a private beach, 2 free-form swimming pools and a spa. Each stylish room has a balcony with partial views of the bay. The spacious rooms at Occidental Grand Papagayo include satellite TV, a DVD player and a safe. There is a coffee maker and a free minibar with beer, soft drinks and water. Unlimited food, drinks and snacks are available from the Occidental Grand’s international restaurants and bars. There is a weekly cocktail party, live evening entertainment and an on-site nightclub. Occidental Grand Papagayo is on Costa Rica’s tropical Pacific Coast, a 35-minute drive from Liberia International Airport. The staff can arrange rainforest excursions or visits to Palo Verde National Park. Daily activities at the hotel include kayaking, aerobics and scuba diving classes in the pool. You can also use the floodlit tennis courts and the gym. Este complejo todo incluido y solo para adultos ofrece playa privada, spa y 2 piscinas de forma irregular. Dispone de vistas a los espectaculares acantilados de la bahía de Culebra y habitaciones elegantes con balcón con vistas parciales a la bahía. Las amplias habitaciones del Occidental Grand Papagayo cuentan con TV vía satélite, reproductor de DVD y caja fuerte. También hay una cafetera y un minibar gratuito con cerveza, refrescos y agua. Los bares y restaurantes internacionales del Occidental Grand sirven comida, bebidas y aperitivos, de manera ilimitada. El establecimiento ofrece una fiesta semanal con cócteles, espectáculos nocturnos en vivo y discoteca. El Occidental Grand Papagayo está situado en la costa tropical del Pacífico de Costa Rica, a 35 minutos en coche del aeropuerto internacional de Liberia. El personal del establecimiento puede organizar excursiones a los bosques tropicales o visitas al parque nacional de Palo Verde. Las actividades diarias del hotel incluyen kayak, aeróbic y clases de buceo en la piscina. El estabecimiento dispone de pistas de tenis iluminadas y gimnasio. Offering an outdoor swimming pool and a restaurant, Corredores del Pacuare is located 3.1 miles from Pascuare River. Free Wi-Fi access is available in all areas of this lodge and the breakfast is included. The rooms will provide you with a balcony, mountain views and a seating area. Featuring a shower, private bathrooms also come with free toiletries and towels. 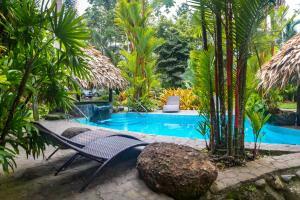 At Corredores del Pacuare you will find a hot tub, a 24-hour front desk and a garden. Other facilities offered at the property include a tour desk and free parking. This lodge is 1,500 feet from the Coffee tour and 0.6 miles from the Butterfly Farm. Juan Santamaría International Airport is 2 hours? drive away. El Corredores del Pacuare cuenta con una piscina al aire libre y un restaurante. Este lodge está situado a 5 km del río Pascuare y ofrece conexión Wi-Fi gratuita en todas las instalaciones y un desayuno gratuito. Las habitaciones cuentan con balcón, vistas a las montañas y zona de estar. Incluyen baño privado con ducha, toallas y artículos de aseo gratuitos. El Corredores del Pacuare dispone de bañera de hidromasaje, recepción las 24 horas y un jardín. También hay un mostrador de información turística y aparcamiento gratuito. Este lodge se encuentra a 450 metros de la visita guiada de café y a 1 km de la finca de Mariposas. Se halla a 2 horas en coche del aeropuerto internacional Juan Santamaría.